Cambridge Consultants, a leading UK technology design and development firm, has unveiled how it has collaborated with start-up company EBR Systems to develop the world’s first wireless pacing system. 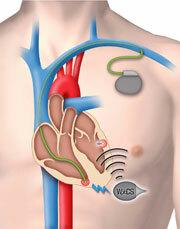 With cardiac stimulation leads considered the weak point in pacemaker systems, the Wireless Cardiac Stimulation system (WiCS) uses a leadless electrode to convert mechanical energy, wirelessly transmitted from an ultrasonic pulse generator, into electrical energy which is used to pace the heart as part of Cardiac Resynchronization Therapy (CRT). Eliminating the lead in the left side of the heart presents a major breakthrough in pacemaker design, and brings new hope for over 2.2 million advanced heart failure patients worldwide, who can benefit from CRT therapy. It also provides a life-saving option for those patients who do not benefit from CRT therapy, either because of the complexity of the procedure, or the limitations of the current technology. WiCS is the first leadless system to be successfully implanted in early human clinical trials at leading centres in Europe. This platform technology will ultimately eliminate all pacing leads and deliver superior cardiac pacing therapy through its flexibility in where the electrode can be placed. Current CRT pacemakers or defibrillators are implanted in patients with chronic heart failure requiring both the left and right ventricles to be paced. Such devices require the implantation of three leads into the heart, one of which involves painstakingly threading a lead through a difficult and complex route running from the right atrium of the heart, out of the heart and into the coronary sinus, a vasculature structure on the outside surface of the heart to the left ventricle. A pacemaker/defibrillator device is connected to the leads which are used to sense heart activity and to deliver electrical stimulation through electrodes at the end of the leads. The electrical stimulation applied to the right and to the left ventricles synchronizes the heart’s contraction in a way that improves overall cardiac function in heart failure patients. However, added to the difficulty of the procedure itself is the chance of lead failure and infection. WiCS overcomes these problems by leveraging advances in energy harvesting microelectronics. A very small leadless electrode, is implanted in the desired location within the left side of the heart. In its first generation, WiCS works in conjunction with a conventional pacemaker/defibrillator, sensing the electrical pacing pulse of the pacemaker from the right ventricle. The pulse generator then transmits an ultrasonic pulse to the implanted receiver, which converts the sonic energy into electrical energy to pace the left ventricle in synchronicity with the right. Not only does this reduce the need for the difficult and complicated surgery associated with CRT pacemakers, but by pacing inside the left ventricle it also better mimics the natural activation and mechanical contraction pattern of the heart. With hospital resources already stretched, the leadless system significantly reduces the time taken to carry out the complicated procedure which requires threading the lead through the coronary sinus vein to the left ventricle of the heart. The WiCS procedure is simple and predictable, resulting in streamlined scheduling of operating theatres and cost savings. The innovative technology was developed in conjunction with leading design and development firm Cambridge Consultants. Using its deep knowledge of integrated circuit (IC) design, Cambridge Consultants helped EBR define the system architecture which could be realised with modern silicon chip technology. Power consumption, size and safety are critical in pacemaker applications, and the team at Cambridge Consultants developed advanced low-power circuits to interface with the ultrasonic transducers and heart monitoring sensors. With reliability critical, coupled with the need for sophisticated signal processing, Cambridge Consultants created two state-of-the-art mixed-signal Application-Specific Integrated Circuits managed by its powerful XAP4 processor to form the core of the WiCS pacing system. During the development, Cambridge Consultants created a full system hardware emulator of the final ASIC so that the other system elements and the software could be designed and fully tested over a year before prototype ASICs were available. This approach dramatically reduced the overall time of the development and enabled EBR to ensure that the system would work as envisaged before committing to the costly and time-consuming manufacture of final product.